Not only did 2016 see Hillary and Jill Stein and Carly Fiorina in the race, but in 1972 both Patsy Mink and Shirley Chisholm were declared candidates for the Democratic nomination. Ben Rhodes was right about the political reporters in DC: they don’t know anything. It’s a shame researching something like this is soooo difficult. 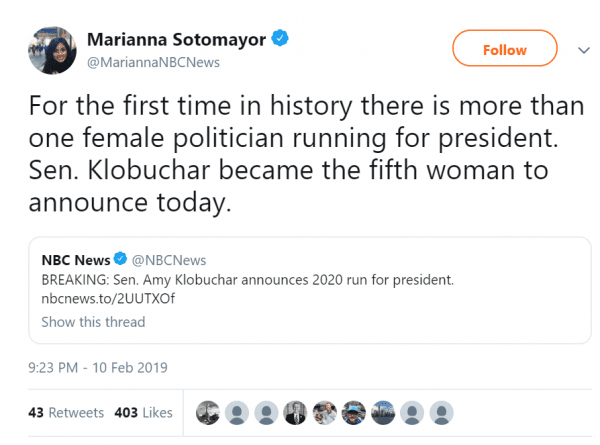 SUPER BONUS: Although her error has been pointed out dozens of times on her twitter feed, NBC *still* has refused to correct.